Hello friends, hope your Thursday is off to a great start. I've had my cup of starbucks and I am ready to tackle whatever today brings. 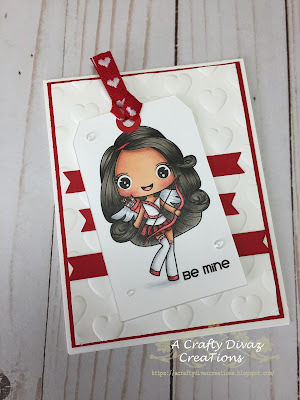 As promised I am sharing the last two cards I created using Stamp Anniething Carley the Cupid. I used the SVG cutting files from Stamp Anniething's shop to create both cards. I used heart embossing folders from We R Memory Keepers and Crafter's Companion as a layer. I colored the images using my copic markers. These cards are ready to send off to some special friends for Valentine's day. That's all I have for you today, check out Stamp Anniething's shop for some super cute stamps. Have a great Thursday!